Looking For Driver Friendly™ DOT Physical Doctors in South Carolina? This link will take you to SOUTH CAROLINA CDL and DOT Medical Card Requirements. 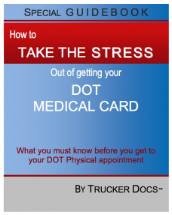 If you have a South Carolina CDL, your Driver Friendly™ DOTPhysicalDOCTOR may even be able to save you time by faxing your updated medical card information to South Carolina DPS.